Since November 2, 2009, the Commissioners of the Town of Church Hill have been working to create a Church Hill Town Code in which all of the Town Ordinances will be located. In some cases, previously adopted Town Ordinances were assigned a chapter and were restated; in other cases they were repealed and new provisions enacted in their place. Public Hearings were advertised and held for each Ordinance prior to their adoption by the Commissioners. The purpose of this notice is to advise Town residents of some of Town Code provisions regarding which the Town receives the most inquiries. Animal Control: Chapter 23 of the Church Hill Town Code. The Town adopts and incorporates in its Code Chapter 9 of the Public Local Laws of Queen Anne's County, including penalties. Enforcement is delegated to the Queen Anne's County Animal Control Officers, 410-758-2393. The law may be viewed on the Q.A. Co. website at www.qactv.com. Building Code: Chapter 27 of the Church Hill Town Code. A permit is required prior to beginning work on the construction, reconstruction, enlargement, alteration or relocation of any building or structure in the Town. A building permit is not required for repairs to existing buildings or structures, provided that no structural changes or modifications are involved. Permit applications may be obtained from the Town Hall during regular business hours. Housing Code: Chapter 44 of the Church Hill Town Code. This chapter is designed to protect the public health, safety and welfare in residential structures by establishing minimum maintenance standards for basic equipment and facilities used for light, ventilation, heating and sanitation for residential structures and premises, and for safe and sanitary maintenance of residential structures and premises by landlords. Littering and Nuisances: Chapter 48 of the Church Hill Town Code. Defines litter as rubbish, waste matter, refuse, garbage, trash, debris, dead animals or other discarded materials of every kind and description and declares that it is unlawful to deposit, throw or leave litter, or cause or permit litter to be dumped on any pavement, street, ally, lane, highway, or public right-of-way, or in or upon any park, parking area, recreational area, or other public property. Open burning is also addressed. Burning permits must be secured from the Town Hall for outside burning, except no permit is required for outdoor cooking of food, open fires for recreational purposes such as campfires, leaves (not closer than 200 feet from buildings), oil/gas fired salamander heaters or warming fires for workers. Burning times are 4pm - 10pm, except for fire department directed burning operations. This Chapter also addresses Public Nuisances, which are any act, object or practice that is dangerous to life or health, any act, object or practice that renders air, food, water and drink unwholesome or unfit for the use of man; odors or exhalations that are offensive to the inhabitants or dangerous to the public health; any accumulations of animal or vegetable matter, solid or liquid, which are dangerous or harmful to the neighborhood, or are likely to become so. Examples may be any trash, waste material, garbage, offensive or dirty material, which may be allowed to accumulate on any property in the Town. Any grass, weeds, briars or brush more than 12 inches tall on any property in the Town is declared to be a public nuisance. This does not apply to trees, cultivated crops, cultivated ornamental shrubbery or plants, lots or parcels devoted to bona fide agricultural use, wetlands, forest, or areas required to be maintained in a natural vegetative state by any governmental agency. Upon 10 days written notice, the Town has the authority to enter the property to abate the nuisance and have it removed. The cost of removal (grass cutting, etc. ), plus a $50 administrative fee, will be assessed against the property owner and shall constitute a lien collectable in the same manner as real property taxes. A Municipal Infraction penalty of $100 may also be imposed for each offense. Zoning: Chapter 75 of the Church Hill Town Code. This chapter establishes the minimum requirements for the promotion of the safety, health, convenience, comfort, prosperity and general welfare of the Town of Church Hill. The law provides the procedures for appeals, variances, special exceptions and all matters pertaining to zoning. The chapter is available for view on the Town's website at www.churchhillmd.com. Snow Removal: Chapter 65, Streets and Sidewalks. This chapter will require property owners in the Town to remove all snow and ice from sidewalks abutting their property within twenty-four (24) hours following the cessation of a snowfall, freezing rain or sleet storm. The Commissioners of Church Hill may authorize the removal of the same by an employee or agent of the Town and the expense shall be billed to the owner and shall be collectable in the same manner as are Town taxes. All information stated above is not to be construed as a legal interpretation of the Church Hill Town Code, but rather a summation of various provisions. 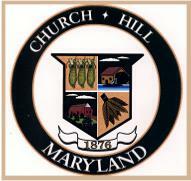 All Chapters of the Church Hill Town Code are available for viewing at the Town Hall or on this website. A copy can be sent electronically to your e-mail address, upon request. Upon completion of the Church Hill Town Code it will be available for viewing on the Town's website at www.churchhillmd.com. Public Notices and other timely information are posted on the site to keep citizens informed. The Town Office has received complaints from Town residents about people walking their dog(s) are allowing their dog(s) to defecate on the lawns of property owners especially between the former Queenstown Bank building and the Post Office. This is a violation of the Queen Anne's County Animal Control Ordinance Chapter 9-21 "Discharge on property of others prohibited." A. Private Property. The owner or custodian of an animal may not allow his or her animal or any animal under his or her care to urinate or defecate on the property of another without the consent of the owner of the property. B. Public Property. The owner or custodian of an animal may not allow his or her animal or any animal under his or her care to defecate on public property unless the owner or custodian of the animal immediately thereafter removes and disposes of any and all waste in a sanitary manner. Animal Control may be reached at 410-758-2393. With the warm weather season approaching, children will be playing outside and exposed to potential health and safety issues. Be a good neighbor and do the right thing. Clean up after your dog(s). The Church Hill Town Office will be giving away FREE trees to citizens on Tuesday, April 23 through Friday, April 26, 2019 between the hours of 10:00 a.m. and 4:00 p.m.
Four species of tree seedlings will be given away this year: Bald Cypress, Common Hackberry, Red Bud and White Oak. They are one (1) year old and average 8" to 10" tall.